The Prodigy Announced as UK Exclusive Headliner at Victorious Festival! Victorious Festival has just made a huge lineup announcement. The festival, which takes place in picturesque Southsea, announced that the legendary electronic group The Prodigy will be their Sunday night headliners. This will be a UK festival exclusive performance, and is certain to be an unforgettable experience! Also announced is Saturday night headliner Paul Weller as well as Paloma Faith, Friendly Fires, Years & Years, Happy Mondays and Everything Everything. 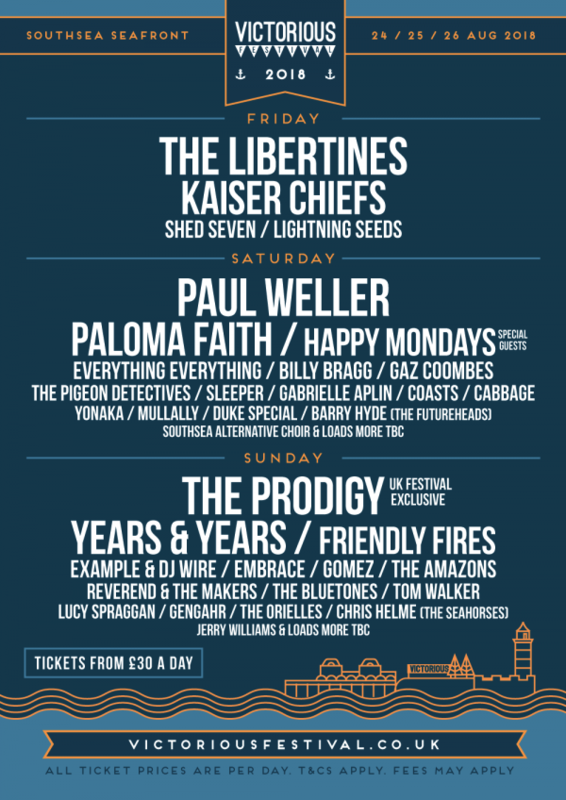 The festival previously revealed that The Libertines will be headlining on the Friday, supported by Kaiser Chiefs, Shed Seven and Lightning Seeds. Victorious takes place from the 24th-26th August along the Southsea seafront, overlooking the Solent. Tickets are available now and can be purchased here. Lover of riffs and cats. Lives in Bristol and goes to way too many gigs. After Soundwaves Announcement Here Are The Bands We’d Love To See Added To The Bill!